NOC scientists and engineers have contributed to a new study, published in Nature Communications, that provides new insights into how giant density-driven submarine flows are able to travel thousands of kilometres into the deep ocean. 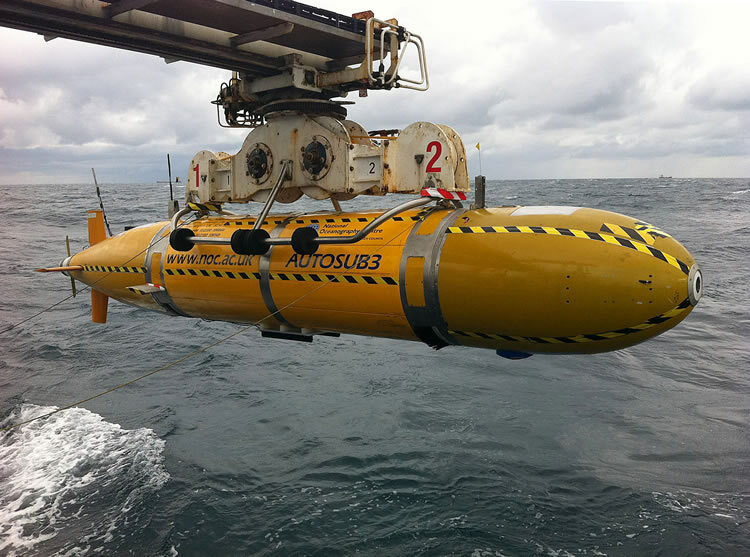 The research team coupled state-of-the-art marine robotic technology with recent advances in fluid dynamics. The results show that, despite forming spectacular channels on the seafloor (hundreds of kilometres long in some cases), the previous theory relating to density-driven flows as underwater rivers is flawed and instead the flows have more in common with jet streams in planetary atmospheres. The team therefore investigated a continuous density-driven flow generated by dense salty water spilling over from the Mediterranean into the comparatively fresh waters of the Black Sea, via the Bosphorus Strait. The density-driven flow is focussed through a channel on the sea floor and transports 22,000 cubic metres of water every second – a volume comparable to the largest rivers on the Earth’s surface. The Black Sea flow provides a unique natural laboratory to study the dynamics of sea floor density-driven flows. The team were able to measure this flow in unprecedented detail by flying a robotic submarine called Autosub3, developed and operated at NOC, within the channel a few metres above the sea floor. Once launched, the submarine operated autonomously for several hours before returning to the surface ship with its data, which included direct measurements of the speed and direction of the flow. The lead author of the paper is Dr Rob Dorrell from University of Hull, and the project leader is Prof Jeff Peakall from University of Leeds. The research team also comprised researchers from University of Southampton, and the Middle East Technical and the Istanbul Technical Universities in Turkey. The research findings will contribute to an enhanced understanding of the potential hazard these flows can pose to critical seafloor infrastructure, such as submarine telecommunications cables (that carry over 95% of global internet traffic) and oil and gas pipelines.